I enjoyed this place! Very open and friendly environment! In a great location that is a 5-10 minute walk to beach. Safe with lots of food options within minutes of hostel. The staff is very friendly and helpful to any questions you have about Panama City. I highly recommend! Great spot to stay. Lots to do right around. Fab hostel; spotlessly clean, great breakfast, comfy beds, and the staff are so friendly and helpful! What’s not to like?! A very nice place with great staff and breakfast. There was always someone cleaning so cleanliness was amazing for a hostel. Also enjoyed the talks at night with the night watchman. And do the Island tour!!! Great location, super clean, helpful staff. The best prices for tours in San Blas. Perfect location, price point solid, and great facilities! Cleanest hostel I've seen! Could use another bathroom upstairs, yes there are a couple downstairs but also a lot of people in each dorm room. Overall would stay again no problem. Very clean spacious rooms with good AC. Location isn’t very close to the main attractions but there is a few restaurants nearby. The pool is very good and the kitchen very well equipped. Free pancakes in the morning also which were very nice. Most of the staff are really lovely and try and help as much as possible. But one of the staff when I asked where I could see a doctor didn’t really help me very much and didn’t seem that eager to either. But other than that we had a really great stay here! 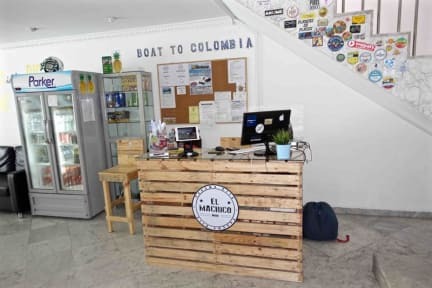 Clean, laid back hostel with a nice atmosphere. Good location, nice pool (though I’ve never seen anyone using it). Breakfast served between 5-9am which clearly caters to people going to San Blas, but not necessarily to those planning to have a lie in. Room had no lock and was always open. Hostel does not accept credit card. Bed was the worse I had in whole Panama. Hostel seems clean.